Spotify provides a streaming service that has been welcomed as disrupting the world of music. Yet such disruption always comes at a price. Spotify Teardown contests the tired claim that digital culture thrives on disruption. 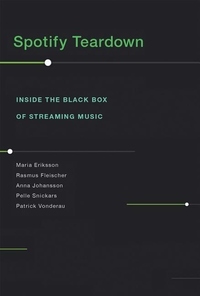 Borrowing the notion of "teardown" from reverse-engineering processes, in this book a team of five researchers have playfully disassembled Spotify's product and the way it is commonly understood.